I don’t need a lot of external management; I can usually determine on my own when to start working on a project, how the work should flow, and other factors to get the desired result. These are two recognized qualities in adults, especially in a business/work environment, and it occurred to me recently that these character traits have evolved since I was a baby. I wondered…Did curiosity and my love of patterns turn into an ability to recognize glitches and irregularities? Was I born with a natural tendency to study things on my own and to transform this internal “timetable” into a creative discipline? It is so easy to remember all the difficulties I have faced, but today, as I sit here pondering various discoveries and experiences I had as a child, this mini-revelation has filled my mind with positive, exciting, empowering, random yet connected, memories. I am grateful these flashes of insight were saved somewhere inside the millions of memory files my brain must have stored over the years. I also feel lucky I was, and continue to be, a curious person with opportunities to explore whatever it is that fascinates me from one moment to the next. I am going to list a few of my favorite flashbacks now, but I hope that you will also take a moment to think back to simple discoveries you may have made as a child. What things brought you an unexpected sense of wonder? What still inspires you now? “On A Wonderful Day Like Today” – the first song I learned how to sing in chorus; and it was really wonderful to hear us all singing different things at the same time and hearing everything blend together. I learned how to hold a note for a certain amount of beats and to stop singing at the same time as everyone else. (I am still trying to master this skill.) A lot of rules for my little brain to absorb, but they all made sense, they all made the music happen! the taste of summer squash cooked by my friend’s mom – forever to be a magical vegetable. To this day, I am reminded of this first taste every time I cook yellow squash. I was equally surprised the first time I had German Chocolate cake (with coconut frosting) at another friend’s house. Her mother was born somewhere in Europe, perhaps Norway, and taught me about amazing things you could bake at home like spiral cinnamon rolls made from scratch with yeast. I love to bake. teaching myself how to braid, accidentally, when 3 strands of hair ribbon were dangling from a light switch at a friend’s house and I decided to play with them, laying each side ribbon across the middle. creating mini-worlds out of earth, fern fronds, twigs and moss on the cement steps in my yard. 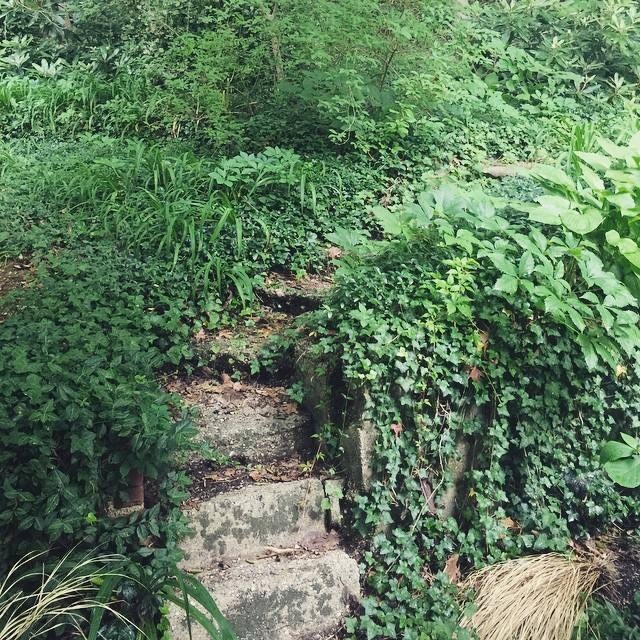 These steps led up the hill to a neighbor’s property (another mysterious land I was not allowed to travel to *smile*.) I would clear small patched of land, build homes and villages, dig ponds and build up mountains. I did not worry when the rain washed it all away; I would simply start again and create a different world.